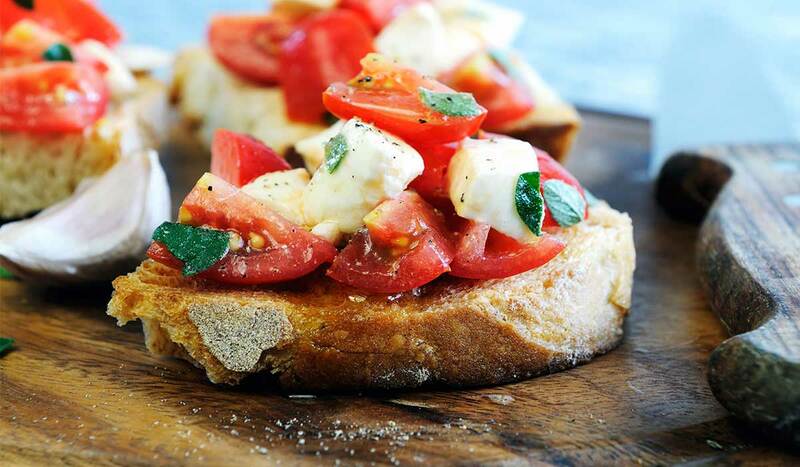 Bruschetta (meaning a little bit burned) is typically thought to of as toasted bread with tomatoes on top but in Italian actually refers to the bread. There is of course a traditional tomato based topping, but the most important part is actually the bread. Start by chopping the tomatoes, without taking out the seeds, throwing out the liquid or peeling them. Put the chopped tomatoes and there liquid in a large bowl with 2-3 garlic cloves that have been pressed or minced, salt, oregano and the basil leaves that have been roughly chopped. Cover the bowl and put it in the fridge for a least 3 hours but not overnight. Slice the bread quite thickly, about an inch or a little more. The toast the bread a grill pan on the stove on high heat works great, or in the oven under the broiled is good too. Traditionally day old bread was toasted over a fire so the idea is to have bread that outside is very crunchy and has at least one black mark and is not completely hard on the inside. How that the bread is well toasted and the tomato mixture has rested in the fridge it’s time to assemble. The tomatoes should stay on the bread when it’s moved, if they fall off, there’s too much topping. The last touch is to spoon a few spoonfuls of the liquid from the bowl over the tomato mixture. This will increase the flavor and make the bread easier to eat. A tasty variation is adding goat cheese or ricotta on top.